There is just the rear three windows showing of a Crossley bodied vehicle on the Chesterfield ex London Transport Reliance posting elsewhere on this site. There is also a deal of discussion as to whether it is on a Leyland or Crossley chassis, well there is no problem identifying the shot above, it is definitely a Crossley. Number 1 in the Chesterfield fleet this batch of Crossley bodies differed from previous batches by having the route number displayed with the destination, which had not been done since the 1920’s. I’m not normally a fan of green liveries, however, the rich dark green and cream of Chesterfield would certainly be an exception. In this picture the driver has opted for some old-fashioned ‘air conditioning’. Here is a link to view the ex London Transport Reliance posting. Nice view, Les! I suppose your liking or not of a green livery would depend on the shade of green and the balance of green and cream. Certainly, the Southdown and Morecambe & Heysham arrangements (before the latter introduced the hideous two tone green) appear to be well liked among members of this forum. NBC green is another matter! This is the view of a Crossley no car driver wants to see. The Austin 8 driver seems bemused! Lovely character photo. I wonder why Crossley used Iron Crosses sometimes, on the radiator, instead of the name. It seemed quite random. On a Portsmouth delivery, there were both styles. Sorry to be picky, and I may be wrong, but isn’t the car in the collision photo an Austin 10/4 rather than an Eight ? I seem to recall that the Eight had a window line that dropped toward the rear, and always had the postwar style grille with V-front and horizontal bars, even on the prewar examples. No, John. It’s an Austin 9 now! Quite right, John, I should have got it right first time, since my next-door neighbour had an 8. Thx for the explanation about the Cross/CROSSLEY aspect, Phil. I remember the Crossleys well,both single and double dockers. I always thought they were slow and noisy. The Leylands and Guys were much better. Chesterfield bought this bus from London Transport it was RW1 in their fleet. Roof windows were more likely to be found on dual purpose or coaches rather than on a bus but this bus had them. It also had a dual entrance with, as usual at London Transport a front entrance and centre exit, I am not sure if Chesterfield changed it to front only doors. If you know, let me know, please leave a comment. Nice photo of the RW, Chesterfield had just gone one man and from then until the mid 70s bought a lot of 2 door buses (about 75) double and single deck. The RWs (Reliance/Willowbrook) was the standard bus for several years in Grimsby-Cleethorpes, London tried 3 but then went for Swifts and Merlins. Chesterfield obviously liked the RW Reliances as they were followed by a fair number of Neepsend/East Lancs Reliances. All of them had centre exits, which the RWs also retained. They were then followed by Daimler Roadliners – total disaster – and Leyland Panthers. All of these were also dual door. As an aside, what is the part-view single-decker with the stepped side windows on the right of the RW? I think the bus behind the Reliance is ERA 95. 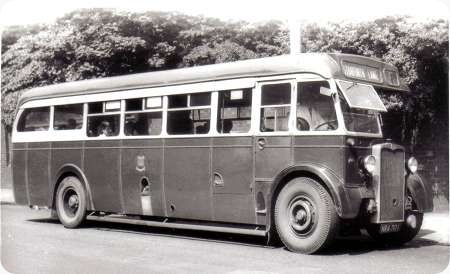 A pre-war gearless Leyland Tiger that had been given a manual gearbox and converted into a mobile canteen. If not it could be one of the single deck Crossleys, but they were all withdrawn when the Reliances arrived as they were their replacements. BBF5 (1965 edition) shows 12 Crossley single-deckers on the fleet strength as well as the RWs, which arrived in 1963. 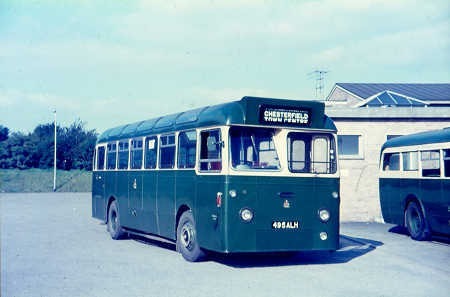 The part of the body visible looks identical to the Crossley body on the preserved Chesterfield Leyland PS1. I should be very surprised if anything prewar had a stepped waistrail like that, since it appears to be derived from the post-war Manchester double deck design. Glimpsing that Crossley-bodied single-decker I assumed the chassis was also Crossley, but the rear hub (had to look hard!) identifies as a postwar Leyland, two of which I understand are preserved. I 1966 I arranged for a college nr Reading to buy NRA 717 and later became a part-owner. We passed it on to Alan Smallie of Worksop as a source of spares for his sister ships. Is either of them on the rally circuit? One or two of the Crossleys survived quite late, although I think in some instances at least not in passenger service. In answer to David Beilby, there was a booklet; Tramlines to Fleetlines, a history of Chesterfield Transport, published by the Council and Transpire, the Chesterfield bus society which contained a picture of one of the Regals, JRA 653 (credited to R Marshall) It was one of four, I too thought they must have been unique! Not sure if the book is still around today, perhaps Transpire could help. Nice pics of Chesterfield Crossley-bodied Leyland PS1 JRA 635 on YouTube: Novawheels. I’ve just noticed that the Reliance is described as MU3RA. Bus Lists On The Web has it as 2MU3RA. However, I once met one of these buses later in life with Brutonian, and it was semi-automatic, which would make it 2MU2RA. Does anyone have a definitive answer to this? I’ve made an enquiry about the Transpire book. Meanwhile those interested in Alan Smalley’s Crossleys may like to take a look at this slideshow. I’m told that the best place to enquire about the booklet “Tramlines to Fleetlines” would be Terminus Publications. Contact details at here. These buses would regularly pick us up from school for our weekly visit to Central Baths on Ashgate Road in about 1971/2. They were often used on the more rural routes to places like Calow Green and Barlow etc. As a kid, I wondered why the upholstery of these buses was finished in red where other Corporation buses had the usual green upholstery. When I was a small boy in Sheffield in the 1950s, my mum worked for Stephenson Blake, typefounders in Sheffield. For many years, the Stephensons took the staff and family members for a summer Saturday afternoon out to Hassop Hall in Derbyshire where they lived. On the occasions that I was taken we always travelled from Sheffield to the hall in Chesterfield Corporation single deck buses. It sticks in my mind that they were Crossleys and that they struggled a bit on some of the Derbyshire hills with their full load! We had a bit of a tour round before arriving at the Hall for the afternoon. Sorry this isn’t very technical but I hope someone finds it of interest. Presumably the buses were hired from Chesterfield because they were cheaper than Sheffield? The three RW class Reliances entered service with London Transport (Country Buses and Coaches) in August 1960, about the same time as I did – I started work from school at Reigate South Divisional Office on 29th August. Having standardised from 1952 on the dependable RF Regal IV for full sized single deck requirements, LTE started to make a cautionary appraisal of the Reliance, first with the RW, and then, in 1965, with the 36ft RC class (a fiasco that deserves a posting of its own on the site). The three RW buses had Monocontrol gearboxes and were thus of the 2MU2RA type, as Peter Williamson has correctly pointed out. The Willowbrook bodywork was added on to a production order for Grimsby Cleethorpes, and was of B42D configuration in line with LTE’s increasing interest in dual doorway buses. Inevitably, the serious shortcomings of the AH470 engine soon became evident, and the inflexibility of the LT maintenance system built entirely round the removal of defective parts and replacement by Chiswick reconditioned units exacerbated the difficulty. LT garages did not have the expertise at local level for analysing and fixing engineering problems, a feature that was to emerge even more seriously later with the DM/DMS Fleetlines. The RWs were tried out on rural routes round the Country Bus system – I rode on them on the hilly 440 service between Woldingham and Salfords (near Redhill) – where the dual doorway concept proved to be something of a liability in constricted stopping places. After a mere three years in service, the entire class was withdrawn in October 1963, and then sold to Chesterfield in December of that year. Astonishingly, two of these buses still survive. Only RW1 featured in the picture above ended up in the scrapyard. The restoration of RW2 and 3, though entirely creditable, does illustrate yet again the distorted bias of the preservation movement towards LT vehicle types. RW3 (497 ALH) has been much in the news this year, having made its preservation debut at Cobham and subsequently taken part in the Brighton run. Its owners have undoubtedly done a first-class restoration. 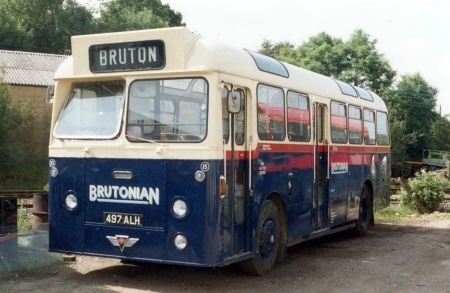 But this is how I remember it: as number 15 in the fleet of the Brutonian Bus Company of Bruton, Somerset, with whom it ran from 1978 to 1987. Seen here in the yard in 1983. …..but I remember it as a Chesterfield bus. Had a meal with my brother and sister in law at the Peacock, Owler Bar, just after Christmas. I well remember the Chesterfield buses on the Fox House runs – and Cordwell Valley was a favourite childhood haunt. The Panthers and Roadliners might not have been man enough for the job but the Neepsend Reliances were regular performers. 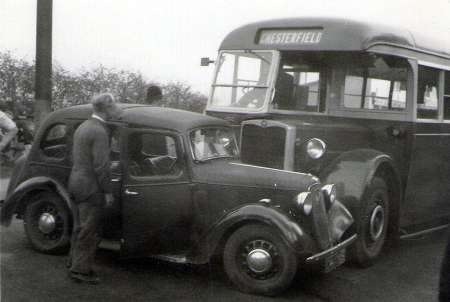 I used to be a bus driver for Chesterfield Corporation Transport from 1966 to 1884. I drove all these buses on Homes Field Barlow the reason they used these buses was because the other buses was 36 feet long these was a lot smaller they had small buses on No9. Spiral run as well. I really enjoyed working as a bus driver with the Chesterfield transport until they brought in one Manning it took all the thrill out of working on the buses. Remember, the Crossley bus was on route to Fox House on Whit Monday 1965 1967. Please can anyone remember the mystery tours I believe on Sunday afternoons from Chesterfield East Midlands bus station! !…They went around the Peak District!! In mid 1960s…. 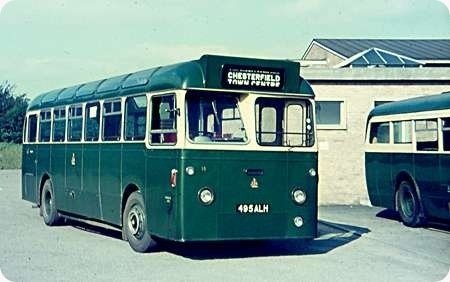 I have only just found this site and find it very interesting as i worked for Chesterfield Transport for 39 years.I drove the 2 old ex-London buses and as i recall they spent a lot of time on Chesterfield to Spital route via Eyre Street, and had to do a reverse at the far end of Spital Lane. I can also remember the old Leyland that was converted to the Mobile Canteen. I worked on this old bus for 3 years.When it was converted it was driven as H.G.V.instead of P.S.V.